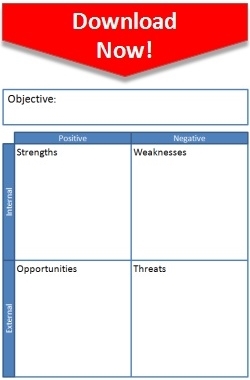 Download this free SWOT Template to help you develop a successful strategy for your project. 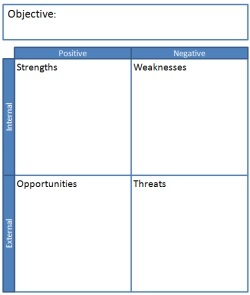 SWOT analysis is considered a basic strategic business analysis tool. Analytical tools such as this are especially useful during the early stages of a project as you develop your project strategy and as part of risk management. This analysis tool takes into account both internal conditions and external conditions. The strengths and weaknesses sections refer to internal conditions such as core competencies, staff turnover, and product quality. The opportunities and threats sections refer to external conditions such as competition, technology, and trends. Strengths are the characteristics of your organization that will help you achieve your project's objective. Weaknesses are the characteristics of your organization that will limit your project's ability to achieve its objective. Opportunities are elements in the external environment that could be taken advantage of to achieve the project's objective. 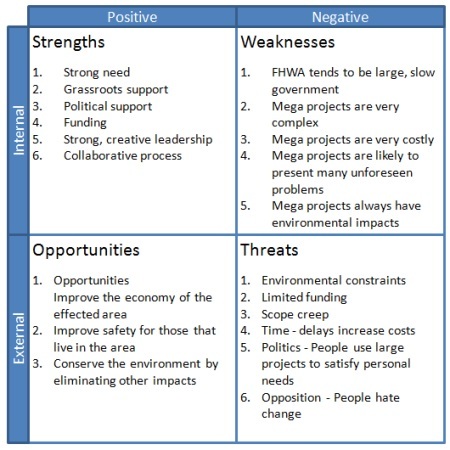 Threats are elements in the external environment that could negatively impact the project's ability to achieve its objective. How can we take advantage of our strengths? How do we minimize the effect of our weaknesses? How can we capitalize on our opportunities? How can we deal effectively with our threats?